More than 1 in 300 newborns have a detectable condition through newborn screening. Whether you're a new or expecting parent, this 4" x 6" card gives you the facts to ensure that your baby is happy and healthy. Interested in learning more about newborn screening? Click here. Whether you're a new or expecting parent, there is a lot of information to make sure that you and your baby stay healthy. 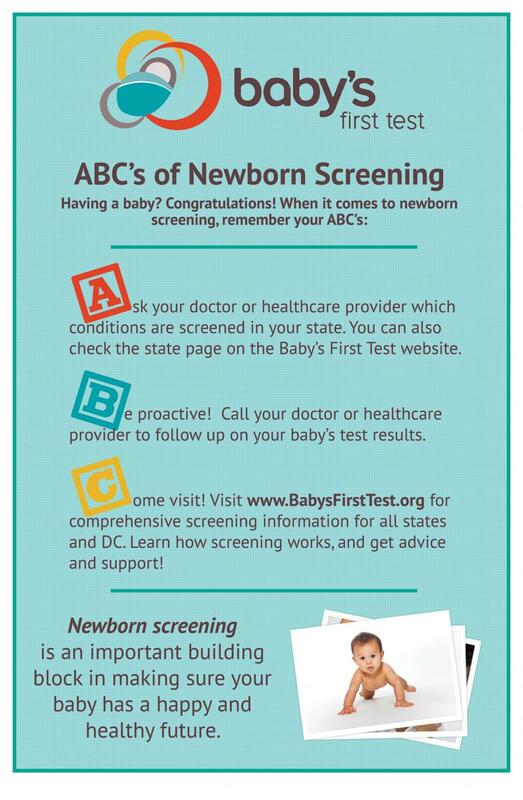 Baby's First Test created the ABC's of newborn screening poster to give parents an easy-to-remember list about newborn screening. Interested in learning more about newborn screening? Click here.